After Chris finished the Appalachian Trail in Maine, we figured it would be the perfect chance to see what Canada’s maritime provinces are all about. So we headed to points furthest NE and found ourselves in Nova Scotia. 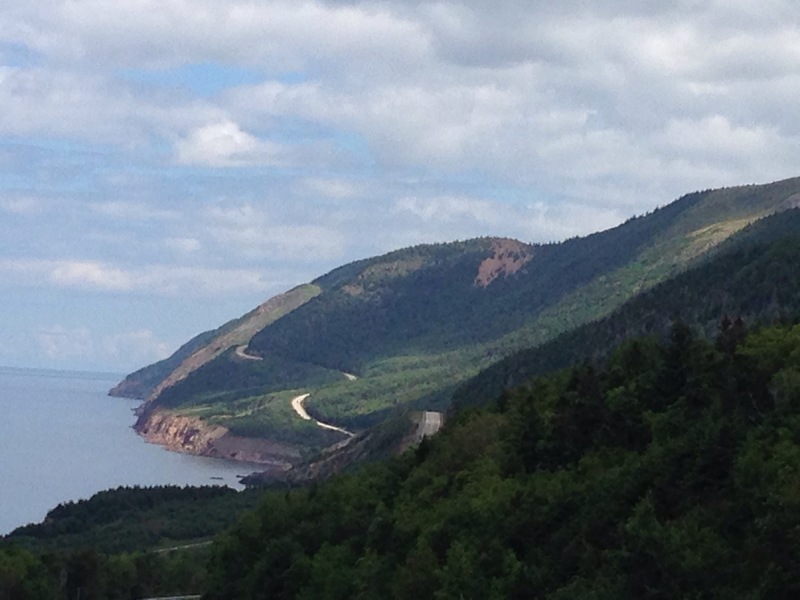 The main thing we did in NS is the John Cabot Trail, and by trail, I mean we did the drive. Poor Chris’s feet were still really hurting from the AT, so some car tripping was all we were good for. But the drive was amazing, all through the Cape Breton highlands, long windy narrow roads with the ocean beside you and in front of you. Majestic views. While in Cape Breton, we also attended a caileigh (pronounced cay-lee), which is a Celtic gathering, usually involving several Gaelic fiddle players. The one we attended featured Ashley MacIsaac, who from what we learned from others in the crowd, was quite the famous musician a few years back. Well, he was amazing. I will definitely be downloading some of his stuff. In Halifax, we went to the Atlantic Maritime Museum, which has a great Titanic exhibit, among others. Halifax was the closest port on that fateful night, so that is where they sent out rescue boats, and where the recovered bodies were taken. Tragic. 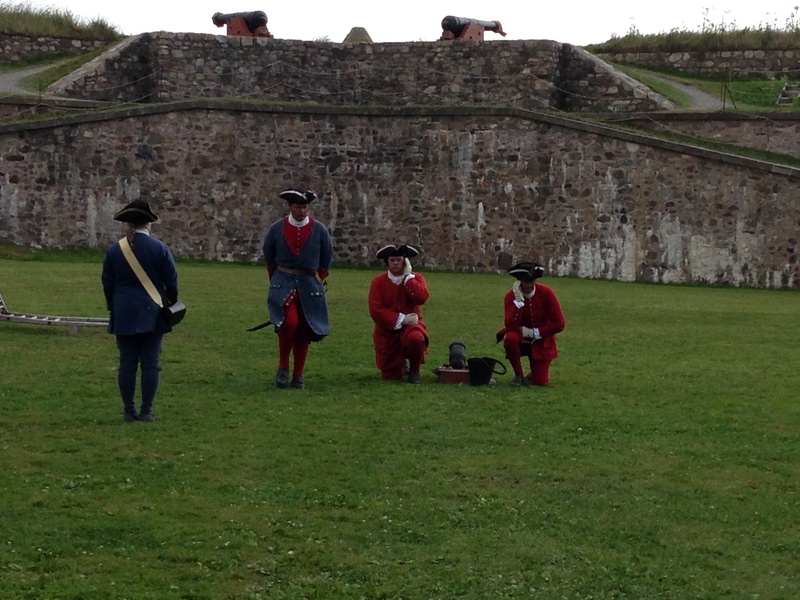 In Nova Scotia, we also visited Fort Louisbourg, a fort from the 1740-1780 time period that has been reconstructed and frozen in time to show you what life was like in that time and place. There are about a dozen buildings you can go into, and talk to the re-enactors about their daily lives. It was pretty neat. From Nova Scotia, we took the ferry to Prince Edward Island. In Charlottetown, they were having a festival celebrating 150 years of confederation, so we attended that and listened to singer/guitar players Ben Caplin and the Mellotones. And ate lobster. Lots of it. Also on the island, aside from the unique geography and the stunning Gulf of St Lawrence views, are the settings and artifacts from the Anne of a Green Gables books. The author, Lucy Maud Montgomery, grew up on PEI and wrote the Anne books based somewhat on her childhood. And finally, New Brunswick. No time for the Acadian drive (think Evangeline, “this is the forest primeval”), so we centered ourselves on the Bay of Fundy, this amazing place where the ocean tides recede up to 40 feet each high/low tide. In Moncton, we saw the Tidal Bore, which is a channel cut so that as the high tide comes rushing in, it creates a 23km long wave, that surfers can crest on. We saw three surfers attempting it on the day we were there. Also in the Bay, at Hopewell Rocks, we visited at high tide, where you can kayak around in the water and look at the interesting rock formations. Then the next day we visited at low tide, and we were able to walk on the ocean floor, looking up at those same rocks! Very fun and very muddy. The days were cool- never above 75- and the nights were downright cold. We alternated between camping and hotels, and saw some amazing stars on the nights we camped out. We ate lots of seafood and poutine. Lobster! !On the way home we stopped for a night in Bar Harbor, Maine (I’ll include it in this post because its practically Canada). Cute little town- crowded! And the Acadia National Park was lovely as well. Such great sight seeing, in our own nation and our neighbor. Next up: the cruise to Australia! Love the way you describe your travels, thanks!